Who’s ready to go back to school? Not really right? That’s OK. This month we have a great issue that will help ease the pain and make it fun to talk about going back to school. This month in WDW Magazine we are going back to school Disney Style. 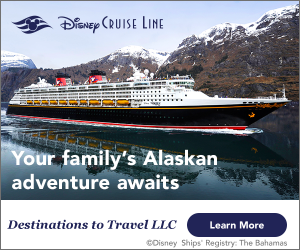 Disney is having some fun this summer with Frozen. It’s all the rage and we thought you’d like to see what’s going on. Wh have a whole section about Frozen Summer Fun which is going on at Disney’s Hollywood Studios. Don’t miss this. In the Best of WDW this month you voted for us to feature Pirates of the Caribbean, the Boardwalk Inn, Kona Café and Sir Mickey’s. As a bonus Michele from The Main Street Mouse talks about how it’s all in the details. This months FanZone Joe Black is back with part 2 of why he loves WDW. We also have our monthly photo contest with some great pictures and we have you telling us your what you’ve learned at WDW. In our Around the World section we take a trip over to the Animal Kingdom Lodge and talk about the guides on the Savannah. We have our regular News and Did You Know features and this month we have a very special look at Splash Mountain at Disney World vs. Splash Mountain at Disneyland. 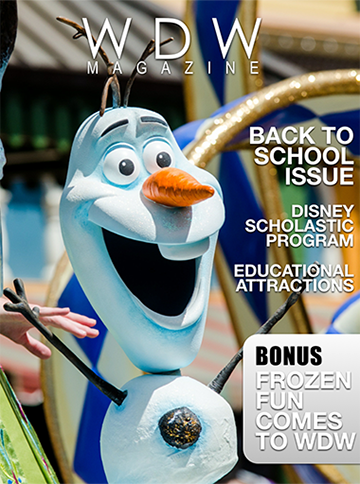 Our Features this month talk all about the educational side of WDW. We answer the question should I take the kids out of school? We look at the educational side of WDW and Disney’s Scholastic Program. We also look at the top 10 educational attractions at Disney World. Our Helping Hands Section we explore the crowds when school is in session.